Patterns looking like this are text placeholders. You can click into (or tab to) such placeholders and start typing. 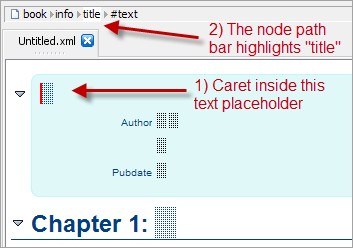 The node path bar, found above the document view, indicates what is selected or when there is no explicit selection, the element containing the caret. XMLmind XML Editor has 2 different kinds of selection, the text selection and the node selection. The text selection works like in any word processor or text editor. Few editing operations apply to the text selection: Edit → Paste, Edit → Convert. For example, you can convert the text selection to emphasis. The node selection looks different than the text selection: a thin red frame is drawn around the selected nodes. The simplest way to select a node is to click on its name in the node path bar. All the editing operations apply to the node selection. The node selection may comprise several sibling nodes, for example, two contiguous paragraphs. The easiest way to extend the node selection is to Shift-click before or after the thin red frame. The element directly containing the caret is always implicitly selected: no thin red frame around it. For example if you want to insert a table before a paragraph, first click inside this paragraph (but not inside any of its child elements, as this would implicitly select the child element) and then use Edit → Insert Before. However, if you want to insert a list after a table, you cannot do that using the implicit element selection because a table cannot directly contain some text. You'll have to first explicitly select this table (e.g. by clicking on "table" in the node path bar) and then use Edit → Insert After. Notice that the two editing operations mentioned above are Edit → Insert Before, Edit → Insert After. XMLmind XML Editor also has less commonly used Edit → Insert editing operation. Insert an element (or text node) just before the node selection. Insert an element right here, at caret position. Insert an element (or text node) just after the node selection. Insert Before often means "Insert somewhere before selection". Insert often means "Insert somewhere inside selection". Insert After often means "Insert somewhere after selection". For the same reasons, XMLmind XML Editor has 3 paste operations and not just one: Edit → Paste Before, Edit → Paste, Edit → Paste After. Unlike Edit → Insert, Edit → Paste is commonly used and works as expected by replacing the text or node selection with the contents of the clipboard. When XMLmind XML Editor, which is a strictly validating XML editor, does not allow you to perform the editing operation you want, it's almost always because you didn't select the right object and/or you are not using the right editing operation. 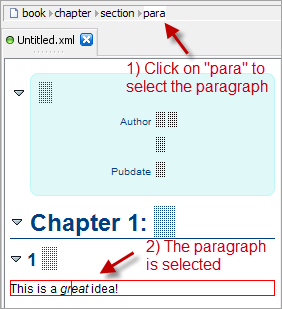 For example, you have clicked inside a paragraph and attempt to use Edit → Insert to add a chapter after it. This cannot work because a paragraph cannot contain a chapter. Instead, first select the chapter which is the ancestor of the paragraph (e.g. click "chapter" in the node path bar) then use Edit → Insert After (not Edit → Insert) and select "chapter" from the list. Watch the screencast corresponding to what's explained above.